COMPETITION OPEN TO UK RESIDENTS ONLY. Just in time for Christmas comes the first ever DVD from the UK’s best loved football show – Soccer Saturday; Cheers, Jeers and Tears, on DVD 11th November. The mark the release I have 3 copies to give away! Revel in 20 years of the show’s funniest football banter PLUS footage produced exclusively for this DVD. All of the golden moments have been painstakingly brought together and are presented by the legend himself – Jeff Stelling. Join in all the fun with Jeff, Kammy and the rest of the team. The ultimate gift for any self-respecting football fan AND the ultimate stocking filler. 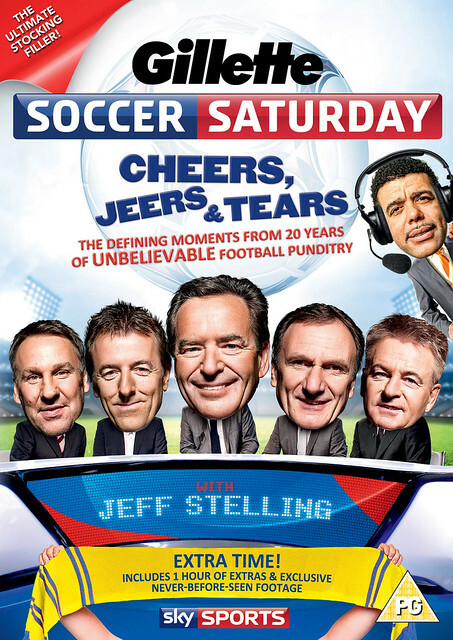 Soccer Saturday; Cheers, Jeers and Tears is on DVD 11th November – pre-order it here. To be in chance of winning, just answer this question – which Sky Sports presenter hosts Soccer Saturday; Cheers, Jeers and Tears? You can also email the me the correct answer by clicking HERE and just tell me the answer in the subject header! I’ll even let you enter on Facebook – just click on the link and pop your answer in a comment. Winners will be chosen at random and notified in due course. 1. Entry to the competitions is restricted to one entry per person please. 3. Prizes can only be sent to a valid UK address unless otherwise stated. 4. Winners will be chosen at random from all valid entries. 5. Winners will be notified via means entered and announced via website, Twitter and Facebook. 6. The Judges decision is final and no correspondence will be entered in to. 7. The competition will run from 23/10/13 until midnight 31/10/13. 8. Feint Zebra is compliant with the data protection act. Our policy is such that we will not pass on your details to any third party without your prior consent. So Leicester Went And Did It! Who will come out on top of the 2015/2016 Premier League title race?